It turns out that Transbay Blog does not excel at taking vacations, since we posted even during our “hiatus.” But in light of the interesting developments that are in store for 2009 on the local, state, and federal levels, this site is returning from hiatus, with the caveat that posts may appear on a somewhat irregular schedule. To make up for somewhat spotty posting during the past couple of months, here is the second installment in our series of track maps, this one focusing on the South Bay; I will probably add more details in the future, so you might consider it a first version. The image at right depicts the intermodal Caltrain/VTA station in downtown Mountain View, extracted from the map. San Jose and its environs possess quite a bit of track used for commuter rail (Caltrain, Capitol Corridor, ACE), freight, and VTA light rail. The map depicts track used by these various systems, with a focus on passenger rail, but select freight track is included to call attention to certain features. The map also includes potential track for the planned BART and light rail extensions, marked lightly in gray so as to not infringe on existing track that is more boldly colored. Since VTA has formally announced its intention to pursue the BART to Silicon Valley extension at the expense of all other Santa Clara County transit projects, we will probably not see both BART and new light rail any time soon. Nonetheless, the extensions are included to illustrate how they connect (or don’t quite connect, as the case may be) to service currently in operation. The map is high resolution and there is quite a bit of white space in places where track is sparse, so you may want to scroll or zoom around to catch the different sections. More detailed notes are included on the map itself, which you can click here to view. And true to form, I realized there was one thing I forgot to add, immediately after posting. Map link is updated, for anyone who might’ve caught the few brief minutes of the first link. I’m assuming it’s a right of way issue, but wouldn’t it be cheaper/faster to avoid tunnelling under Caltrain/VTA at Diridon, and then crossing back over the tracks at Santa Clara? Just stay east of the Caltrain tracks. Lots of empty space south of and around the airport. Too bad there’s no hope of passing in front of SJC rather than stopping at Santa Clara. If they need the yards, hit SJC first, then swing around the north side of the airport, then hit Santa Clara. BART’s planned station box at Diridon is placed under the current parking lot directly east of the tracks. The tunnel continues west of the tracks to turn northward, but then crosses back to the east side of the tracks to access the old UP Newhall Yard and use it for BART yard and shops. With respect to airport connection, the theory is a people mover to connect the airport to BART/Caltrain in Santa Clara (west of Mineta), and also to the Metro/Airport VTA LRT station (east of Mineta). Apologies, everyone: I made one more small change to the map. The most recent version has a “4” appended to the end of the file name, and the link in the post is fixed. TOW: there’s too much going on in the world! Anyway, I find drawing track maps to be incredibly relaxing and therapeutic, for some reason. You still forgot one tiny little detail on the VTA: the connection that allows trains to loop back from 1st to 2nd street at the north end of the downtown transit mall. 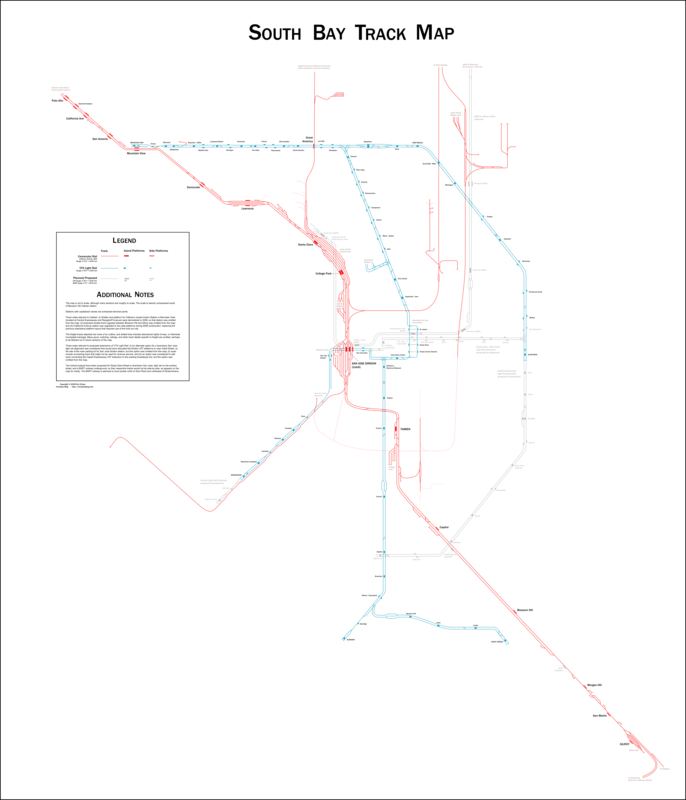 Also, in the near future Caltrain plans a few changes to the track layout around the Santa Clara-San Jose area. After they finish Palo Alto, they’re going to start construction on a new island platform at Santa Clara, between the northbound Caltrain and Alviso line tracks, with a pedestrian tunnel. At the same time, they want to add two platforms to the Cahill Street Station, presumably with four new passenger tracks, taking over the space where their maintenance facility was before they moved in to the CEMOF. Also in the works (and about as likely as the “proposed and postponed” light rail) are Capitol Corridor related expansions: double tracking from CP Coast to north of the Great America station, and adding a fourth mainline track from Cahill Street to CP Coast. Hello, anonymouse, I appreciate your taking the time to write in. As for the VTA downtown track detail: thank you. The little segment of track you’re referring to I had actually originally inserted, but the program I’m using is a bit unstable, and it keeps losing bits of track I’ve added, often just a line or two here or there (sometimes way more though, unfortunately), and then I don’t notice the minor omissions till much later. That is actually why I’ve already uploaded 4 separate versions in the past 24 hrs, I keep noticing little bits that went missing. Thank you for pointing out that missing connection, I will fix it later today and upload a new version, and then add a comment here when the update is posted. It’s wonderful to have you “back.” And the map is positively mesmerizing. Wow. This map even further illustrates how insane Bart to San Jose really is…it completely bypasses the major job/tourist/living corridors of San Jose..utterly ridiculous. WOW, what a map! Cheers! Very well done on that map! You know that VTA already said the SJC people mover isn’t going to happen, right? Fritz: yes, I do, hence the choice of the word “theory,” since these kinds of projects get proposed as theories and then abandoned once the realization sets in there’s no money. VTA’s tendency to abandon any non-BART transit project is something I’ve written about here before on a few occasions. The #10 bus already makes those connections, in any case. Two missed opportunities. First, VTA’s Capitol Expressway extension shouldn’t end under Hwy 87, but should turn south (via tunnel or narrow, single-track right of way) along 87 to Ohlone-Chynoweth Station, then continue to the Almaden station on what is now a too-short, single-car shuttle. Second, I drive 85 to get through or around San Jose, and while I am no fan of transit running down freeway medians,* it’s too bad VTA didn’t think to build a line west from Ohlone-Chynoweth to Los Gatos – they’d have been there 10-15 years earlier than the Vasona line, and while it wouldn’t have given as direct a connection to downtown, it would have provided a useful cross-valley link (much as 85 does for drivers), and it would now make a fine transit loop. Would of course be harder to retrofit now, but tougher lines have been squeezed into place (i.e. San Diego’s elevated Mission Valley line along I-8). *There was a brief golden age of the Guadalupe Light Rail line when the tracks were in operation but the freeway had not yet been built, so the rail line provided a unique link and the stations were peaceful. Plans for Capitol LRT did briefly consider a Capitol/Guadalupe connector track, though nothing was formally approved on that. It would be a good feature, but it didn’t seem that important for this map, because with VTA’s funding priorities, who knows if we’ll even see this line at all? Still, since you’ve made the request, I’ll try to remember to include it in a future version. I still think the biggest LRT-related missed opportunity in San Jose is not so much further extensions into sprawl, but postponing LRT on Santa Clara-Alum Rock, which is one of the more urban areas in San Jose, could actually use the upgrade, and would be useful operationally. Apologies to anonymouse and whoever else might have been waiting: it slipped my mind that I hadn’t made that small correction to VTA yet, but it’s corrected, and the link is updated.